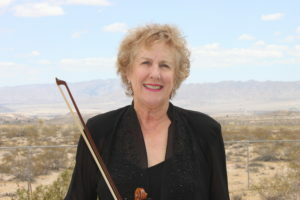 Violinist Mary Lois Franzman-Kelly has performed with the Folsom Lake Symphony since 2011. Previously, she played violin for the Marin and Santa Rosa symphonies, the Joshua Tree Philharmonic and the Vallejo Symphony 1993 Akashi Japan tour. From 2000 to 2015, she was first violinist with the Orange Coast Community Orchestra. Mary Lois holds a bachelor’s degree from San Francisco State University in music performance and has done graduate work at California State University, Sonoma. She has been accepted into the master’s program at CSU San Francisco. She holds a California teaching credential and is retired from Santa Ana Unified School District as a music specialist.